A summer like evening made for exciting racing at Bullring of the Poconos and many drivers descended upon Snydersville Raceway. The 2018 SlingFest presented by R.G. Hoffman Electrical Contractors highlighted a $500 to win AllStar Slingshot National Tour Race and a $350 to win Jr. Slingshot National Tour Race with many of the Slingshots best drivers duking it out on the 1/8 mile raceway. Along with that we also had a complete Regular Show of Karts, Champs, Microstocks, and Quarter Midgets to fill the bucket of fun at The Ville. The AllStar Slingshots came in full swing with 13 Tour Racers and Snydersville Veterans taking to the tricky flat track. The 35-Lap Feature proved who had the best setup as the track dynamically changing over the course of the race. Stroudsburg’s own Jared Silfee knew how to make the S&S Speedway’s #55 work around the tight bullring but multi-time National Champion Brett Bieber and Snydersville Pro Dillon Emmons kept the pressure on Silfee. However it wasn’t enought for the young gun and Jared Silfee took home a back to back SlingFest Win in the AllStars. With the win came $500, the tour point lead and a guaranteed starting spot for Tricky Triangle Challenge at Pocono Raceway. 2017 National Slingshot Champion Brett Bieber came out with a solid 2nd place finish over 2017 Snydersville Slingshot Champion Dillon Emmons rounding out the top 3. Snydersville Veteran Kyle Herve worked his way through the field to bring a 4th place finish and Snydersville past-champion Greg Zellman rounded out the top five. 6th- Matt Mertz, 7th- James Benz, 8th- CJ Fritz, 9th- Emily Fleming, 10th- Andrew Turpin, 11th- John Turnure, 12th- Jasper Zeigafuse, DNS- Tanner Jones. The Jr. Slingshot drivers showed amazing talent as 12 young guns piloted around the bullring in the 25-lap main. Kasey Hufcut figured out the bullring quickly and was able to snag the pole position through the qualifying and heats, and led the field to the green. Hufcut had a decent advantage early on but it wouldn’t last long 2017 Jr. Slingshot Tour Champion “Lil Miss” Shelby McLaughlin was on the hunt for the lead. McLaughlin having started her racing career at the Ville knew that lap traffic was her only chance to snag the lead away. With a little over half the race, Hufcut would be held up by a lapped car and McLaughlin went to bottom of Hufcut as they entered into Turn 1 and was able to grab the race lead. Shelby McLaughlin remained focused and pulled away from the field and the Stroudsburg native drove home to another victory at her old stomping grounds beating out a highly competitive field. “TVD” Tanner VanDoren, who won the race last year, struggled early on but pulled off a killer move on the restart to take home a second place finish. Snydersville Regular Brian Smith rounded out the top three in the tour with Tyler Ulsh bringing home a fourth place finish, and rounding out the top five after leading half the race and getting quick was Kasey Hufcut. 6th- Aidan Donaldson, 7th- Wyatt Taschler, 8th- Paulie Hartwig III, 9th- Kenzie Adams, 10th- Jacob Taylor, 11th- Tucker Cole, 12th- Micah Adams. Paul Hartwig III grabbed the Kid Kart win over teammate Craig Sprague Jr., taking a second place finish. Wyatt Troyer Fink mixed it up with the front two but fell short to take home third place, and Mason Jenkin rounded out the field in fourth. After a couple rough races previously Cristofer Buehl piloted his Jr. Sportsman Champ to victory lane. Griffin Hendershot pulled off a slick move from 4th to 2nd and held onto that position to finish runner up to Buehl. Brandon Walsh, after missing a couple weeks, brought home a top three finish over Division Champion Cadence Freeman who rounded out in fourth, and Xavier Sprague struggled in this race, finished in fifth. 6th- Tre Mammana. 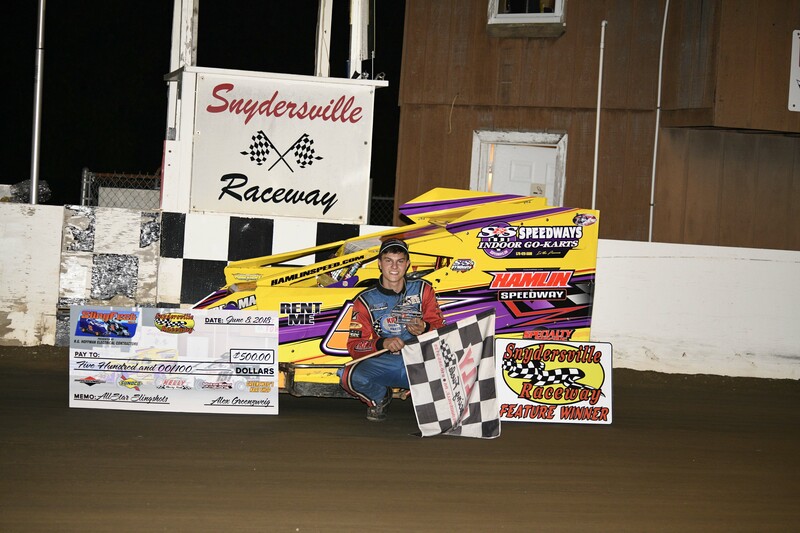 Matthew Rodenbach narrowly beat out Blaze Croop for the Briggs Stock Light win, in a photo finished with a margin of victory of one one-thousandth of a second (0.001), making it the closest finish in the history of Snydersville Raceway. Blaze Croop took home the second place finish and Bobby Smith rounded out the top three in third. Cadence Freeman continues to dominate the Jr. Sportsman class as she picked up her fifth win of the season. Griffin Hendershot remained consistent and took home another second place finish on the evening. Cristofer Buehl while still getting acclimated to the flat kart, showed a lot more speed and kept up with the leaders to bring home a third place finish. Eric Lieb continues to improve week after week and took home a fourth place finish. Matthew Rodenbach picked up another win in the Briggs Stock Heavy class over Michael Korman who kept the pressure on Rodenbach to take home a close second place finish. Brandon Cochran also joined in the mix up front but ran out of laps finishing in third, and Rich Whitman rounded the field finishing a close fourth. Billy Proctor continues to dominate the Sr. Animal Champs pocketing another win over young gun Ben Demott making his debut start in the class. Chris Kraemer, coming from a background of pavement racing, can add dirt racing to his resume, as Kraemer put on a dominating performance in the Sr. Flathead Champ division taking home the win. John Martinsky Sr. who led the whole race and looking for another win on the season, wasn’t able to hold off Kraemer to finish in second. Jeffery Shire Jr. made his return back to Snydersville for the summer rallied up to a solid third place finish. John Martinsky Jr. worked his way from the back to take forth, and Chris Hendershot struggled on speed but took home a top five. 6th- Paul Valent, 7th- Kenny Maconeghy. Wyatt Yetter brought home the win in the Beginner Quarter Midgets over Lakota Vivona, finishing in second, and Levi Vivona, rounding the field out in third. The racing action sure didn’t disappoint last night as the track, racers, and fans would beat mother nature to squeak another week of racing into the books. The track also had a special treat last night with a special appearance by NASCAR xFinity Driver Spencer Boyd and his crew. Even with a lighter than normal kart count of forty-four entries, the racers put on exciting wheel to wheel action in each of the nine class for the eager fans of Snydersville Raceway. Here are the results from this Friday. Snydersville Veteran Jason Wolfe dominated the Briggs Stock Light Money Race but not without pressure from the young gun Alex Kolonics looking to continue his money race winning streak. The two would battle it out with Wolfe getting constant pressure from Kolonics and after multiple attempts to get the lead, it wouldn’t be enough to get by and Jason Wolfe pocketed the $150 and added another win to his book. Alex Kolonics came home in a close second place, Bobby Smith rounded out the podium in third, and Brandon Cochran finished in fourth. DNS- Justin Morgan, Paul Morgan Jr.
A stout field of Kid Karts started the night off for the feature races. Craig Sprague Jr. the pole sitter took the green flag from Mr. Starter Bob Stull with Wyatt Yetter in second. However, Yetter would spin out and hit the tire in turn two bringing out the first caution of the feature. The Green Flag came out and the future stars put the pedal to the metal. Laps ticked away but many more cautions plagued the race as the drivers tried to learn how to get around the bullring. Checkered would fall and the winner of the first feature race of the evening was Craig Sprague Jr., followed by Wyatt Yetter finishing second, Wyatt Fink rounded out third and Jackson Shrewsburg rounded the field out in fourth. A gloomy and wet Good Friday didn’t hold back the racers and management from opening for the 2018 season. After putting many hours into the track, a slick and moist surface made for exciting racing from the first green flag to the final checkered flag. Forty-eight entries of racers came out no matter the weather to get the racing itch cured.